The first time I travelled to Canterbury it wasn’t by car or by train: it was via literature. 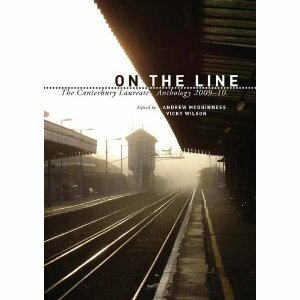 So begins my Introduction to On the Line, the anthology that marks the end of the laureate scheme and the beginning of an exciting new era in Literarary East Kent. So imagine it’s not Wednesday 5 January, 12th Night. The decorations are not being crammed back into boxes, the christmas lights are not being extinguished. It’s Wednesday 15 December 2010, the launch of the Canterbury Laureate Anthology. You’re clinking glasses with local writers from Canterbury, Whitstable and Herne Bay; congratulating the Laureate Squad on their absolute commitment to young and/or up-and-coming wordsmiths; shaking hands with the junior laureate squad, four sixth formers who are doing their best to stimulate creativity in their schools. The Laureate Scheme is over but the legacy is only just beginning.